Planets start out with a bang. During the last stage of planet formation, planetary embryos collide with other protoplanets, causing their surfaces and mantles to extensively melt. Will it be possible to directly image such molten protoplanets with future telescopes? This is the question that was addressed by a team of young PlanetS researchers. Irene Bonati, who in the meantime moved from ETH Zürich to the Earth-Life Science Institute in Tokyo, tells what she and her colleagues found: Sometime in the not too distant future, we may be able to catch a glimpse of a glowing young rocky world, that may be not too different from our own home in the universe. During the final stages of planet formation, planetary embryos slam into other protoplanets. 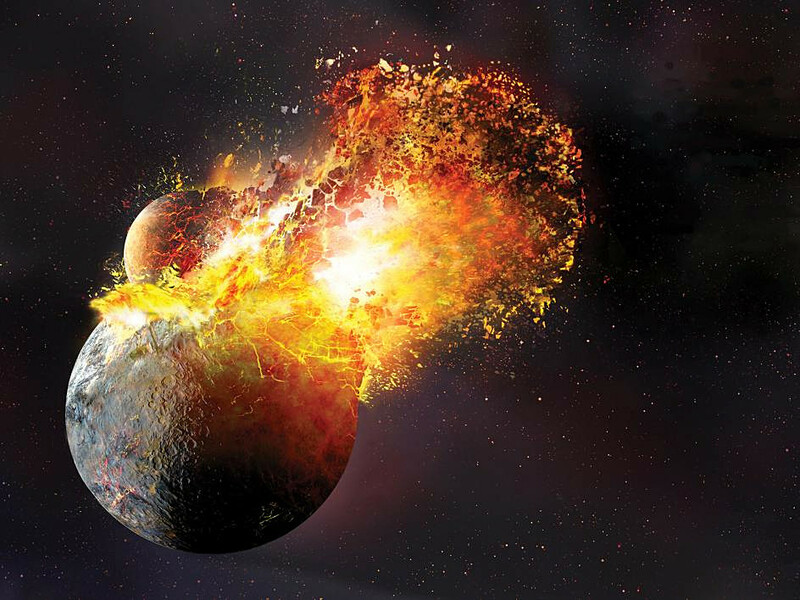 One such collision between the proto-Earth and an impactor created the Earth-Moon system and resulted in a so-called magma ocean: a mixture of molten silicates and volatiles that extends throughout the entire planetary mantle. Being the last globally molten episode during the evolution of a forming planet, magma oceans set the stage for the early surface environment and atmospheric properties, from which our own world eventually developed life-sustaining conditions. Unfortunately for the curious geophysicist, but fortunately for life as we know it, several billion years of plate tectonics on Earth have erased most telltale signs of the magma ocean, and so we barely understand how this once hot and molten inferno transformed into the habitable planet we know today. However, we expect the general principles of rocky planet formation to be similar around other stars, and therefore we think that giant impact events should happen frequently on planets that are currently forming around young stars. This presents humanity with the opportunity to take a snapshot of the collision afterglow of giant impacts in other, exoplanetary systems. Such a direct detection of a still-molten protoplanet would constitute the key to unravelling the early evolution stages of planetary growth, and decipher how young worlds start out their lives. What does the ‘afterglow’ look like? During the globally molten stage, protoplanets are extremely hot, with surface temperatures as high as 3000 K, and very bright. One would thus think that they are easy to spot in the night sky, but unfortunately that is not necessarily the case. In fact, as the molten mantle solidifies, dissolved volatiles, such as water and carbon dioxide, become oversaturated in the magma and are gradually released into the overlying atmosphere. In the absence of strong stellar winds or high levels of ultraviolet radiation from its host star, a planet’s secondary atmosphere will persist and thicken, thus hiding the planetary surface from the observer like a cloak. At the same time, it will act as a thermal blanket and prolong the cooling timescale of the magma ocean. While the existence of magma oceans has been suggested by theoretical models, such globally molten bodies have not yet been observed in the universe. Because we expect the number of impacts between planetary bodies to decrease over time, young systems present the best chances that, right at this moment, at least one such magma ocean planet is lurking around a nearby star. Young and close stellar groups are therefore the best places to search for planet formation in action. In order to be observable, however, these molten bodies must satisfy two conditions. First, they should be located not too close to their central star, as it might be challenging for a telescope to spatially separate the molten protoplanet from the much brighter host star. 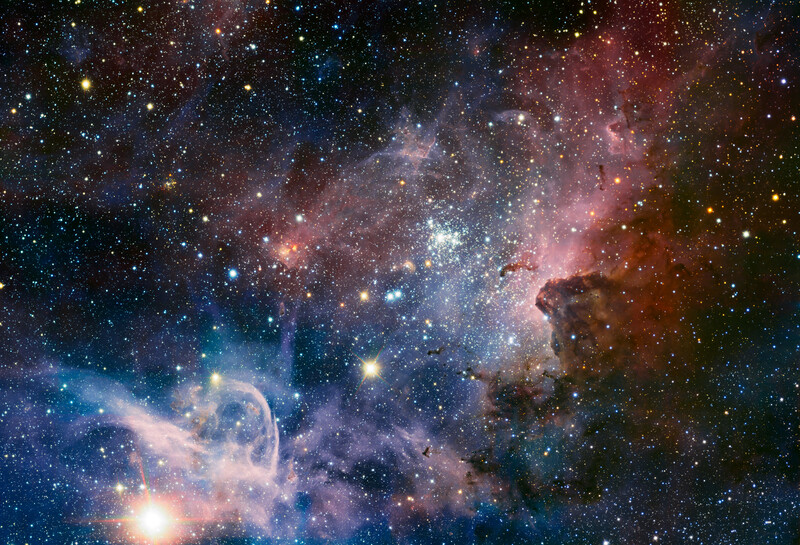 Second, the magma ocean should emit enough radiation through its overlying atmosphere to be spotted by the telescope. A molten body with no atmosphere will appear brighter than one with a thick atmosphere that blocks heat radiation to space. However, this does not necessarily mean that fainter bodies cannot be detected at all; the overall time spent staring at the body is an important factor playing into this. For example, if a telescope looks at the sky for ten hours instead of one hour, it will be able to image increasingly fainter bodies. The emitted flux above which a body can be observed by a telescope within a given time interval is related to its so-called sensitivity; a telescope with high sensitivity will detect fainter sources. With regard to the emitted flux, molten protoplanets represent an attractive target for direct imaging, because they are likely to be much brighter than older Earth-like planets. So, if we ever want to start capturing direct ‘photographs’ of terrestrial extrasolar planets, molten protoplanets are a good start! What are our chances of finding an afterglow? Unfortunately, even with the most advanced imaging instruments available, direct detection of molten planets remains tantalizingly out of reach. 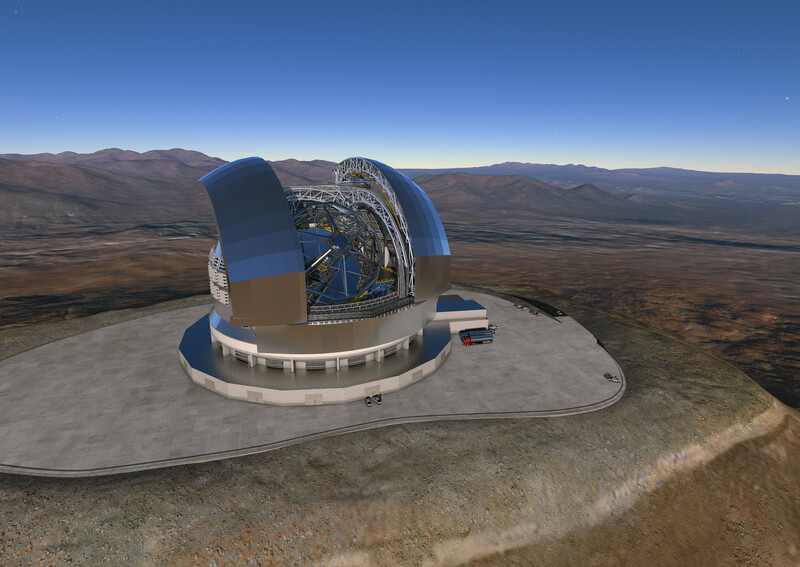 However, in the mid 2020’s (i.e., very soon, astronomically speaking) the era of the extremely large ground-based telescopes will dawn upon us: ESO’s 39 m ground-based Extremely Large Telescope (ELT) will start its observations in Chile, closely followed by the Giant Magellan Telescope (GMT), and the Thirty Meter Telescope (TMT). In addition to these new ground-based observatories, concepts of future space-based direct imaging missions to photograph Earth-like planets in the temperate zones of Sun-like stars are readily discussed in the community. One such concept is LIFE (Large Interferometer for Exoplanets), a mid-infrared free-flying space interferometer concept promising unprecedented performance for characterizing extrasolar planets. How likely is it that we could detect a protoplanet collision afterglow with the envisaged line-up of future observatories? The probability depends on two main factors: the number of giant impacts that one or more bodies experience in a given planetary system, and the time interval during which a molten body remains hot (and hence bright) enough to be spotted by a telescope. During this time interval the planetary flux is above the telescope’s sensitivity. In order to constrain the likelihood of observing molten protoplanets, we first determined the occurrence rate of giant impacts using N-body simulations of planet formation. These simulations track the orbital evolution and growth of planetary embryos as they coalesce, via pairwise collisions, into fully-fledged planets. 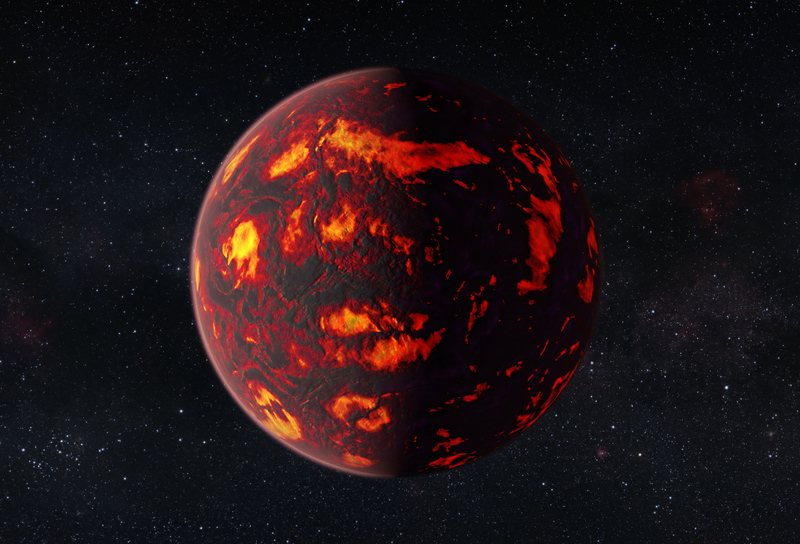 Then, with the frequency of magma ocean inducing impacts in mind, we computed the evolution and lifetime of the magma oceans to determine the surface temperature evolution for a given planet size and atmospheric thickness. The latter is expressed by the so-called emissivity; the lower the emissivity, the more insulating is the atmosphere. The magma ocean lifetime varies from hundreds to millions of years. Larger bodies with thick outgassed atmospheres will sustain magma oceans for longer, but they will also display lower brightness temperatures and emitted fluxes, that is, they will radiate less energy to space and most likely end up below a telescope’s sensitivity. Naturally, the best place to start searching for magma ocean planets with ELT or LIFE is the vicinity of the solar system. The most promising targets are young, close and massive (i.e., containing a large number of stars) stellar groups, as they are expected to host the highest number of magma ocean inducing giant impacts. For ten of the closest stellar associations in the neighbourhood of the Sun, we now connect the obtained numbers of giant impacts for the age of a given association with the anticipated lifetimes of the magma oceans. Imagine now, we have a telescope (either ELT or LIFE, which feature different wavelength sensitivities) and we were to look at all individual member stars of a given association. Would we find a molten protoplanet? The answer is neither a straight ‘Yes’ nor a ‘No’. Rather, the answer is a statistical likelihood, depending on a number of physical parameters. For instance, the βPictoris association is located at a distance of 37 pc (1e15 km) from the Sun, hosts 31 AFGKM stars, and has a mean age of 23 million years. The probability to detect at least one magma ocean planet among these stars/planetary systems is negligible if we use a filter that is very insensitive, but it can be as high as ~80% for observations with either LIFE 5.6 μm, or ELT 2.2 μm. The above calculations have shown that hope is not lost: with near-future instruments we will have a reasonable chance of detecting molten protoplanets and thus bring us closer to unraveling the mysteries surrounding the origin and evolution of our own world, and the place of the solar system in the context of the exoplanet population. In order to come closer to that goal in the next few years and make more robust predictions, there are several key questions that need to be resolved: what are the typical variations in volatile content of rocky planets, how do these volatiles partition between the mantle and atmosphere of the young planets, and what are the most promising atmospheric windows to observe them? Furthermore, we need to better constrain the characteristics of the individual member stars of the most promising candidate associations in our study: βPictoris, but also Columba, TW Hydrae and Tucana-Horologium. This needs the combined efforts of theorists and observers, astronomers, geophysicists, and -chemists, in order to better constrain the properties and evolutionary paths of terrestrial worlds. Then, sometime in the not too distant future, we may be able to catch a glimpse of a glowing young rocky world, that may be not too different from our own home in the universe.